NMC lockout tag. Prevent accidental or unexpected startup or release of stored energy when working on equipment and machinery. Unrippable, write on and laminated. Header "DANGER" and legend DO NOT OPERATE ELECTRICIANS AT WORK THIS LOCK/TAG MAY ONLY BE REMOVED BY:". 0.015 Mil unrippable vinyl. OSHA Compliant. No grommet. Measures 3-inches length by 6-inches height. 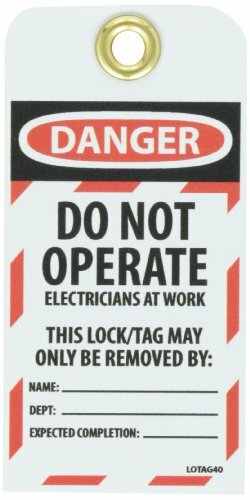 Header "DANGER" and legend "DO NOT OPERATE ELECTRICIANS AT WORK THIS LOCK/TAG MAY ONLY BE REMOVED BY:"